Dr. Thommy, you should be ashamed of yourself for producing such a stupid cartoon. 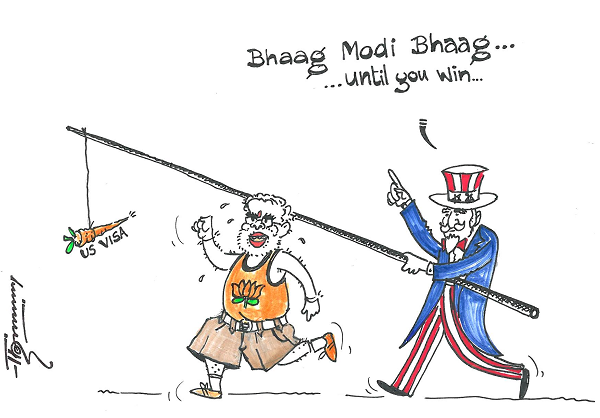 Modi doesn't give a damn about American Visa. He is perhapse the last hope for a rudderless India run by corrupt people. Once he becomes the Prime Minister of India, he will be invited by the same countries who are denying him one now. And he rightly, will ignore such invitations. Proud Indians have shown guts in the past. Jawahar Lal Nehru whilst visiting the grounds of Vatican was invited by the Pope to come and meet him. Nehru turned down the invitation reminding the Pope that when Mahatma Gandhi wanted to meet the same Pope, his request was flatly turned down. I suggest that you Dr. Thommy start drawing a cartoon in which those who deny Modi a visa now, are lining up to see him, and he is pondering over whether to let them or not. speak before joint season of both the legislative bodies.